So, obviously this list is built to capitalize on the Book 3 guild minion the Mounted Guards. Individually, these horsemen provide a lot of good abilities. They’re fast; relatively tough with armor +1, 8 wounds, and a 0 action to give themselves and everything near them a + to defense flips; and a Melee 6 saber and ever popular Guild Peacebringer (both with critical strike built in, of course) to dish out punishment. Their real value to the crew, however, comes from their interaction with other models in the crew. Whenever they declare a charge against a target, they can bring any other friendly model with a Cg of 7 or more that’s nearby along for the ride, placing within 2” of where the Mounted Guardsman ends up, creating the titular “Cavalry Charge!” effect on the game board. This creates some awesome maneuverability, especially since their other front of the card ability, “Reinforcements” lets them push friendly models engaged with their charge targets away. This bonus movement is a key advantage for the crew, and can help overcome its lower model count. So obviously this crew needs a mounted master to lead them, and that brings us to Lucas McCabe. He’s fast enough, and since Mounted Guardsmen are all minions, his upgrade tossing shenanigans grant them the full benefits of the thrown upgrades as well as "Promises." A glowing sabre being tossed to someone with a cavalry charge action could lead to some very injured faces. Also, its not like anyone doesn’t take Badge of Speed anyways, but its clutch for this crew as a means of overcoming their reduced number of activations. As for the rest of the crew, the options for staying within the Cg of 7+ theme are a little limited in Guild (there are more if you take Lucius with his upgrade and hire Mounted Guards into the Neverborn, but that’s for somebody else’s blog post.) Just to stay with the mounted combat theme, I went with Pale Rider and The Lone Marshall. 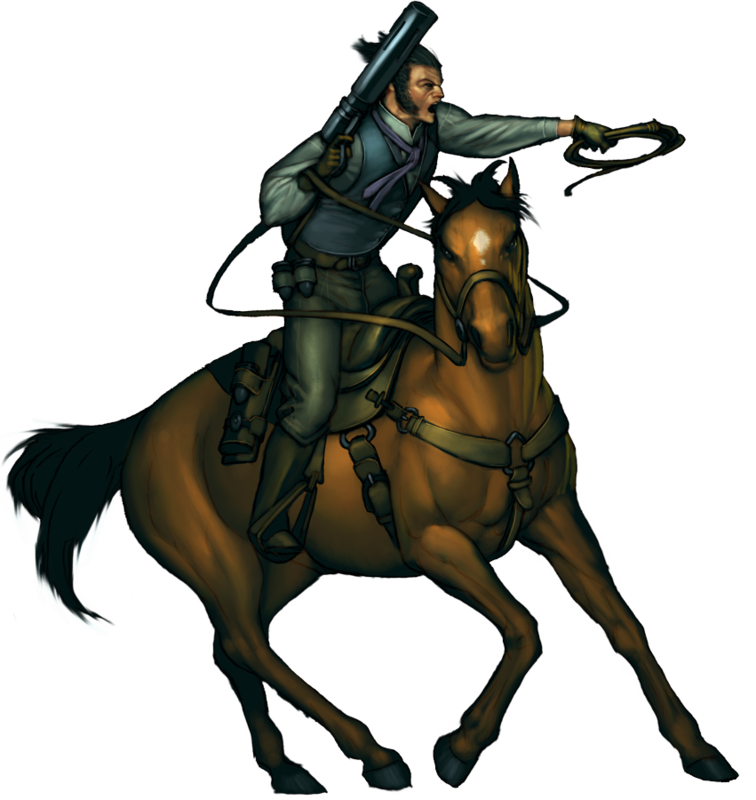 Lone Marshal is no slouch in melee and can tank, but I sort of envision a bubble of McCabe and Mounted Guards taking the fight directly to the enemy while Lone Marshal and/or Pale Rider take flank sweeping duty followed by scheme running. Once you reach later turns, Pale Rider will be better suited to get into the mix and try to capitalize on his big-time damage outputs, but as usual with the Riders its best to keep him distant early on until he can protect himself. Also, his zero action lets him drop scheme markers rapidly as well, filling what is very obviously a gap in the crew. There are some other models you can take in their place that make the charge numbers (Lady Justice is one slightly terrifying option, surprisingly Sonnia’s Purifying Flame totem is a less frightening one.) McCabe has always had strong synergy with Guild Hounds using his totem, Luna, and they can charge right along with the Guardsmen as well. Is it a great crew? I don’t really know. The only model I’ve ever used on the tabletop was a Lone Marshall once in the early days of Wave 1, and he got mulched by a Red Joker damage flip with Lady Justice that left a bad taste in my mouth. The big risk, as I’ve kept mentioning, is that you’re going to get out activated in most games so you’re going to have to make those activations count by having a plan, sticking to it, and executing it. Chances are, a more mixed force with some elements of the cavalry mixed with strong support models like Austringers will end up being more competitive, but I still think you could beat some people with this crew. Be the bullies (this is the Guild, after all), and pick on the weaker models to get them out of the way so you can focus fire the big-bads down as a team. Use McCabe to protect the other members of the crew, as he’s much more tanky and frankly if you start losing models your crew is going to fall apart in chunks. I think they’ll be very good for some scheme pool/strategy combinations, less effective for others where they have to split up to claim quadrants, but I love the theme, so I want to see what they can do. You know, after I get done with this narrative campaign thing, that is. Speaking of which, time for a quick update! The Outcast and Restrictionist crews are both off to strong starts thus far, with both winning by healthy margins in the first two games. A lucky injury flip on a belle has resulted in a belle that drops multiple corpse markers when it dies, which is troubling since Anna’s bringing Spare Parts. The Outcasts have notably made it through the first two weeks with a clean slate for injuries, and Hannah’s suit currently sports a fearsome steam gatling gun for ranged support. Bringing up the rear are the brave forces of the Guild (clearly their defeats coming due to treachery and deceit,) but early reports from Week 3 suggest that Ryle’s Retaliators’ fortunes may have changed.